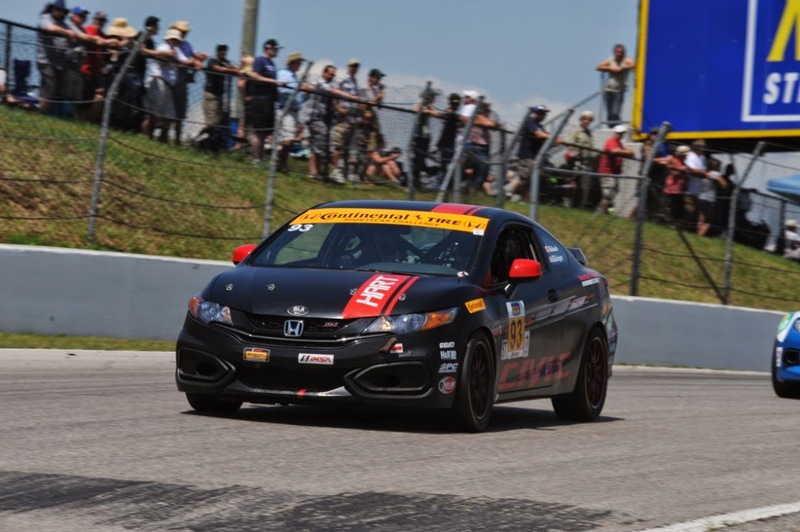 Canadian Tire Motorsports Park is the only international race on the Continental Tire Sports Car Challenge schedule, but is well known to the U.S. and Canadian fans. 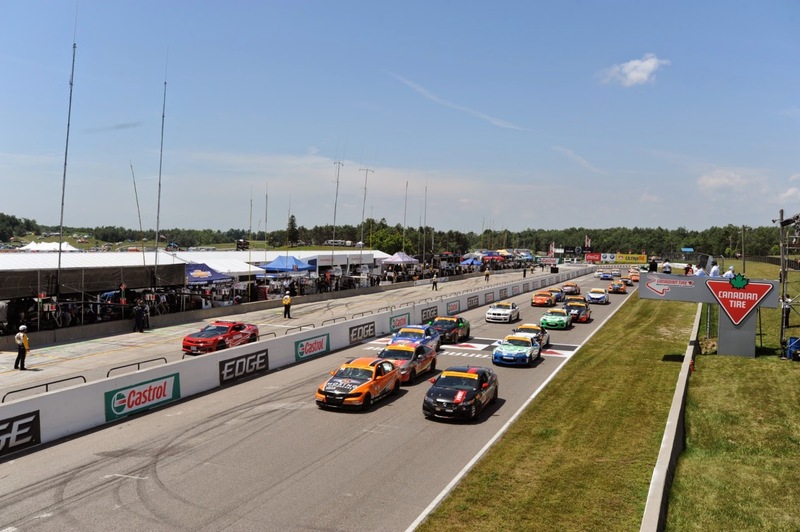 CTMP (formerly known as Mosport International Raceway) is an old-style circuit that is very fast, with many blind corners and little runoff area. This is the kind of track where a small mistake can lead to big consequences, but a little bravery can gain many spots on the grid. The event kicked off Wednesday with a promoter test day. The HART drivers had never been to this circuit before, so it was crucial to get a head start on vehicle setup and allowing the drivers to learn the track. Drivers Kevin Boehm and Michael Valiante would be the only ones able to make the test day, but both have plenty of experience setting up cars, so the team was in good hands. In Practice 1, Boehm and Valiante had a good handle on the track, so the focus was to get the cars set up to run consistent pace. The track is very fast, with little braking zones, which figured to make it very difficult to pass in the race. Track position would be key, and the cars would need to maintain pace. By the end of the opening session, #93 was in the eighth position and #92 landed in 15th . There was very little time separating the top 10 cars, so a couple of tenths improvement in lap time could move a driver up many positions. Practice 2 would be early Friday morning. With the absence of Steve Eich, who was unable to make the event, Chad Gilsinger would be slated for double duty this weekend, taking stints in both #92 and #93 during the race. To do this, the rules required him to get practice time in each car, so Gilsinger started the session in #92 and finished it in #93. With this being his first time seeing the track, he would spend the entire session working on his lap times. Boehm continued to work on setup and perfecting his line, as well. By the end of the session, both drivers felt much more comfortable even though their times were only good for 14th and 18th. As the team prepared the cars for qualifying, the drivers were reviewing video and looking at data, seeking any little bit of time advantage. As mentioned earlier, track position would be key, so qualifying would be more important than ever. The qualifying session would also take place later in the day, when the track temperature would be much higher. This often results in a drop in the cars’ lap times, so it would be crucial to get a good lap in early. The two HART cars would once again plan to work together to optimize their qualifying performances. There is one long straightaway at CTMP which can benefit the cars if they have a draft. The #92 and #93 planned to share the draft lap after lap, in hopes of giving each car an advantage. Boehm would be qualifying the #92 car for the first time, and Gilsinger would continue his qualifying efforts in #93. Within the first couple of laps, the cars would see their fastest times before losing the sweet spot on the tires. Gilsinger was able to make the best of his lap, putting the #93 in second place to start the race, while Boehm made a minor mistake on his lap and had to settle for 12th on the grid. 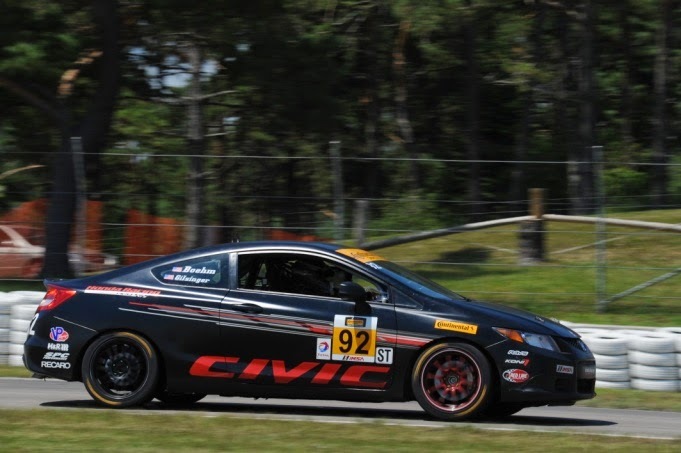 Once again, this proved how competitive the Continental Tire series is, as the ten-spot delta between the two cars represented only 0.7 seconds in elapsed time. Saturday was race day and the temperature was in the mid 80’s, with sunny skies. The crowd on hand was well into the thousands as many took advantage of the beautiful weather to see some great racing. As the green flag flew, the roar of the cars filled the valleys of the circuit between its concrete barriers. Gilsinger tried making a pass for the lead multiple times in the opening laps, but finally had to settle into second position. Boehm had a good start and was able to maintain position just outside of the top ten. Both drivers were pushing hard for almost an hour as the track stayed green. Even though the tires started to show significant wear after about 30 minutes, #92 and #93 maintained position until the first caution flag came out, almost an hour into the race. Gilsinger was sitting in third after being passed by the Mazda MX-5 driven by Randy Pobst, and the team needed to pit him to get him into the #92. As the caution laps continued, the team prepared for its first stop, and all of a sudden, Gilsinger felt a vibration. “I think I have a drive shaft going bad!”, Gilsinger radioed to the crew. Shortly thereafter, Gilsinger found #93 without fourth gear. The gear had broken, and the chance for a podium result would be gone. Gilsinger would pit the car from third and Valiante would take over. While the car’s chances for a good finish were done, the team decided to have Valiante continue, in order to pick up as many points as possible. Now that Gilsinger was out of #93, the team planned to pit #92 once it reached its pit window for a one-stop strategy. Boehm was now running in the top three, but was starting to have some misfire concerns. As the car came in, the HART crew performed another amazing pit stop, and got #92 serviced without losing any time. Gilsinger was now behind the wheel, and ready to make up for the problems of #93. Unfortunately, #92 was already having problems of its own. On multiple occasions per lap, the car would develop a misfire, causing a lack of power/acceleration feeling. This would make it nearly impossible to pass other cars, while also making it difficult to defend position against other cars. Gilsinger brought #92 back to the pits for diagnosis, but ultimately, there was nothing the team could do. Both #92 and #93 would have to endure until the end of the race, simply trying to pick up the most points possible. They finally crossed the finish line in 21st and 22nd places, respectively. Later, it was discovered that #92 had a “fouled” spark plug which was causing the misfire. "This track is the hardest track I have ever been to,” said Kevin Boehm, driver of the #92 car. “The corners are so fast and blind, with no run-off areas. A small mistake can lead to a major crash.” Even though the finishing results were not what the team members had hoped, they were still very thankful that the cars (and drivers) made it through the event with no damage. Not all the teams were so lucky. This would make it much easier to prepare for the next race at Indianapolis, now less than two weeks away. The Continental Tire Challenge cars will be running on the new Grand Prix circuit used by the Indy cars, while also kicking off the Brickyard weekend. The Canadian Tire race will be televised on Fox Sports 1, Sunday 7/20 at 10am EST. 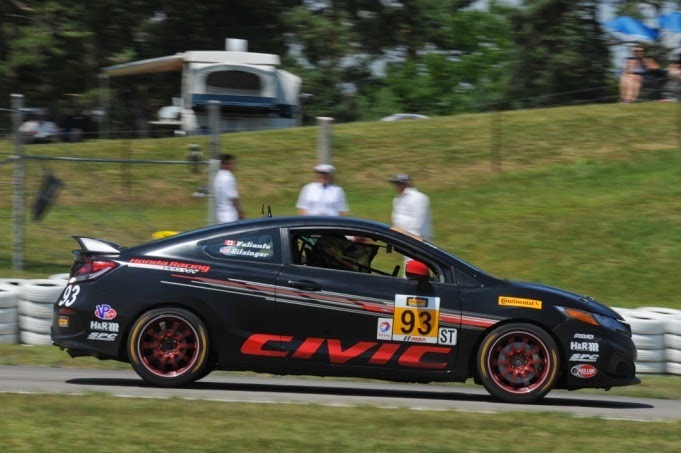 The next Continental Tire Sports Car Challenge event will be at Indianapolis Motor Speedway, July 24-25.